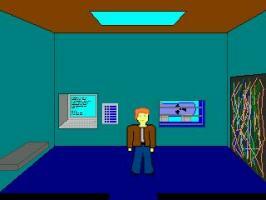 You play as Mac, a young boy who comes into a clash with the police and is sent to a human nature research institute in New Mexico. You are meant to escape from the institute. I hope I got rid of the bugs. The inventory acts a bit odd occasionally, but you should be able to play it. The readme contains some maybe usefull information. Not a bad little MAGS game. Although a couple of sketchy puzzles took the fun out of it a bit. Quite a fun game, though one of the puzzles involved activating the inventory from the top right corner of the screen which I didn't know was there....but I suppose thats what you get for not checking out the manual hehe.